There is one reason it took us a month to tell our parents and now two months to announce this to the world: We are trying to forget it ever happened. The “it” is purchasing our return tickets back to the USA. 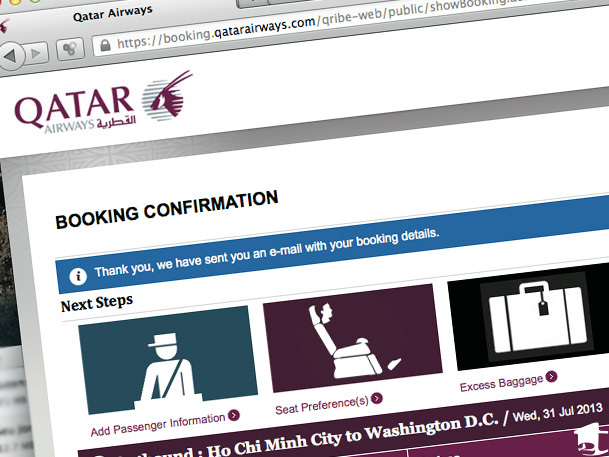 On July 31, we will take a dreaded (but maybe slightly eager) ride to the airport in Saigon. We will smile at immigration officers one last time. And an exit stamp will be squeezed into an overcrowded passport (though now that we added 48 more pages, there’s a lot more room for stamps), before we board the final one-way flight of our round-the-world trip. We are going home. We are excited to see family and friends again, but this concept of home has never been more vague to us. Right now we are nomads. Homeless. Even though we are returning to DC, we do not have to stay there. Who knows where a job will present itself, and we would welcome the opportunity to live somewhere new. After traveling around the world, Croatia, Portugal and Singapore top our list of other countries we would love to move to. But for now we are job searching in our homeland — with DC as our base — and perhaps do a little side research on expat opportunities abroad. We will see what comes our way, and like always, we are up for anything. What will happen to our blog? We will take you through our return and reintegration process in the same way we blogged about our predeparture preparation. Everyone is anticipating some sort of reverse culture shock for us (“What do you mean soup is $7?! That’s too much. I’ll give you $1.50.”). And you will probably be curious to learn how employers view our 14-month joyride. Let’s hope they are as adventurous and open-minded as we are! Keep following us. This journey is not over. Wondering why we went on this RTW trip in the first place? Find out! This entry was posted in Points of View and tagged adventure, backpacking, bucket list, challenge, culture shock, long-term travel, new chapters, status update, thoughts, travel. Bookmark the permalink. You certainly don’t have to sell us on Thailand, especially the food. I drool thinking about som tam! Thank you for the kind wishes, Karisa. Ah, can’t believe you guys are heading back so soon! I know you’ll land on your feet and this next chapter of your life will be filled with tons of new adventures, but I definitely understand your reluctance to head back. When you’re planning, 1 year seems like so long, but once you’re on the road, it goes by in a heartbeat! I think we spent just as much time planning for this trip as we did on the road. Time has sped by, but we have made it enough of a point to always grab the moments that are important and stop. Usually, Tara or I will just say something to the other to get them to realize the significance of the moment, “We are one of ten people on this island. Sitting on a beach, watching the sunset in Cambodia. Who knows when we will have an experience like this again?” If you can just stop in enough of these moments to do more than experience them, but to appreciate them, time does slow and a year can seem like a lifetime. Oh man. I can only imagine what this must feel like. I hope to never find out personally. We don’t wish it on anyone! Speaking from experience, Singapore is a great place to be an expat! Good luck with the rest of your trip and reverse culture shock and future job search! Thank you, Edna! I think we’d really enjoy living in Singapore. Glad to hear you did and recommend it. We got a good feel for the “suburbs” since we were Couchsurfing there, and liked it a lot. Going “home” (whatever that is) can be really tough. We’ve done it twice now and it’s more difficult each time. We’re in a situation like you, nowhere to stay (family of course, but no apartment or house or our own). We start the job search again (ours is mobile marketing, so we are provided with hotel rooms while on a contract…handy). Reverse culture shock is crazy but so so true. We wish you guys the best, and look forward to following your continued adventure! Two times?! I was hoping you’d say it gets easier. We’re really lucky to be able to stay with family while we get back on our feet. The whole process seems way more intimidating than anything we’ve done the past year. I guess just because we’re used to it now 🙂 Thanks for the wishes! Good luck! When we finished our 18 month trip we decided to completely change our lives around. This is just another chapter for you guys! Thanks, Paul! We’re still hoping new, exciting opportunities arise. I think you’ll find your journey opens many new doors for you. You’re young, educated and now truly worldly unlike most people. And let’s not forget that the economy is much better than when you left.